Nicole McInroy, 39, of Charles City, passed away Monday, April 1, 2019 at the Floyd County Medical Center. Funeral service for Nicole McInroy will be held 10:30 A.M. Saturday, April 6, 2019 at Hauser Funeral Home with Pastor Mike Downey of the Evangelical Free Church in Charles City officiating. Burial will be at Riverside Cemetery in Charles City. Visitation will be held from 5:00 to 7:00 P.M. Friday, April 5, 2019 at Hauser Funeral Home and continue one hour prior to the service on Saturday. Nicole Christine McInroy, the daughter of Donald and Debra (Guthart) McInroy, was born on March 16, 1980 in Charles City. Nicole was a special gift from God. She was born with severe cerebral palsy. She had an infectious smile and a huge belly laugh. She loved to go to her brother’s baseball games, go cruising on the river on her pontoon boat and watch daddy and mommy fish. She loved riding on her golf cart and taking long rides in her special van with daddy. It was always a special treat when her niece Savannah visited the nursing home to sing for her and the residents and she enjoyed Savannah pushing her down the hallways in her wheelchair. Her favorite baseball team was the Chicago Cubs. Most of all, she loved her Dukes of Hazzard boys. She had every episode of the Dukes and watched them over and over again all day long, every day. Nicole loved her dog, Mitzie. Everyone knew she was “Daddy’s Girl.” Nicole was surrounded in life by so many that loved her dearly. Even though she couldn’t talk she was able to teach us so much about life. 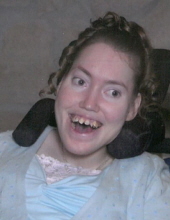 Through her many near-death experiences, her pain, her seizures, and disability she still had a smile on her face and made a positive impact on many lives. Nicole had a special purpose for her life. She taught us that we are supposed to trust God and draw closer to Him for all of our needs. We were blessed to have been a part of her life. We want to thank everyone who worked with her and became a special part of her life at 11th Street Chautauqua. Living family members include her parents Don and Deb McInroy; brother, Lee (Tami) McInroy of Forest City; niece, Savannah McInroy; special aunt and uncle, Becky and Mike Thome of Charles City; close friend, Amanda Knapp; paternal grandmother, Marilyn McInroy-Nettleton; 13 aunts; 13 uncles; numerous cousins; and her extended family also including the staff and residents at the 11th Street Chautauqua. She was preceded in death by her maternal grandparents, Russell and Nola “Dody” Guthart; paternal grandfather, Lenard McInroy; and uncle, Scott McInroy. Memorials may be given to The Caring Pregnancy Center or Cerebral Palsy Foundation. To send flowers or a remembrance gift to the family of Nicole McInroy, please visit our Tribute Store. "Email Address" would like to share the life celebration of Nicole McInroy. Click on the "link" to go to share a favorite memory or leave a condolence message for the family.